Do Superfoods Help With Better Sleep? Superfoods are foodstuffs that have a rich density of nutrients and bioactive components packed with varied health benefits. Food is directly linked with serotonin, a vital hormone that along with vitamins B6, B12, and folic acid, helps one to have a sound sleep. Superfoods are foodstuffs that have a rich density of nutrients and bioactive components packed with varied health benefits. Food is directly linked with serotonin, a vital hormone that along with vitamins B6, B12, and folic acid, helps one to have a sound sleep. Consuming superfoods can help calm the body, increase serotonin levels, and allow the body to get a restful sleep. Almond is filled with magnesium, which is a great substitute for relaxation. This nut variety boosts the level of protein intake in the body, which helps to sustain blood sugar levels for a longer time. This helps one to sleep peacefully through the night. Walnuts, that boost the memory power has another hidden component in them, which helps one to sleep. Research from the University of Texas Health Science Center pointed out in a study that walnuts are a source of melatonin. This component not only offers antioxidant properties, but helps one with good sleep too. Generally, tea contains caffeine and is said to push one to the working mode with full energy. According to a research from Department of Pharmacology, Okayama University, Chamomile tea increases urinary levels of an amino acid, glycine, which is supposed to relieve spasms and acts as a mild sedative. Consuming this half an hour before bedtime can help one with a relaxed sleep. Decaffeinated green tea contains theanine, an amino acid that reduces stress levels and induces sleep through relaxation. It is a widely known fact that bananas are a high source of potassium. But, this superfood also contains another component called L-tryptophan, an amino acid that greatly induces one to sleep. This superfood has a lot of health benefits as it is filled with antioxidants. Researches point out that dark cherries are abundant in melatonin, which is a sleep-inducing hormone. If one is suffering from insomnia, then eating cherries can help. Researchers from Louisiana State University pointed out that consumption of tart cherry juice two times a day for two weeks increased sleep time in older adults with insomnia, by about one and half hour. 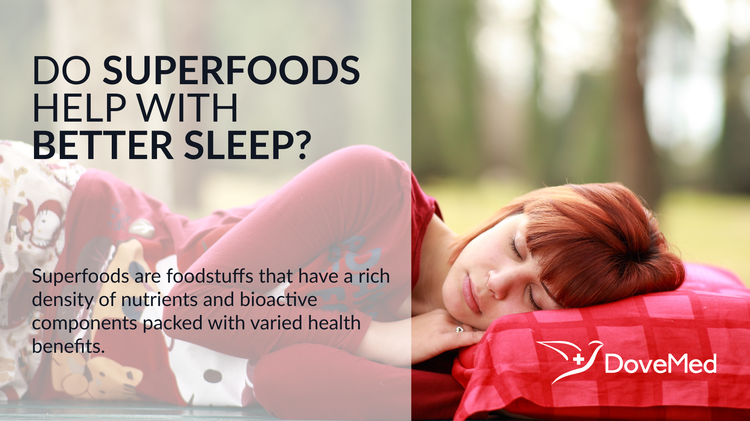 The main benefit of superfoods is to allow one to sleep at peace and wake up with good energy levels. Superfoods change the way one’s body functions and helps them to tackle a lot of ailments and chronic illnesses effortlessly. The complete nutrients in superfoods allows one to attain a peaceful sleep and in turn also helps in lowering cholesterol levels, reducing hypertension, and inducing weight loss. Pratt, S., & Matthews, K. (2007). Bottom Line's superfoods Rx: how to unlock the power of foods to prevent and even cure disease!. Bottom Line Books.